Tom ‘Steve’ Mulholland’s career got off to a blistering start. In 1906 he became just one of a handful of players awarded international recognition by the Irish FA prior to their eighteenth birthday, and earned rave reviews from those watching, despite the 0-5 defeat inflicted on Northern Ireland by England on 17th February 1906. A month later he picked up a second cap on 17th March 1906 against Scotland in a 0-1 defeat. Amazingly, given his long career, was to be his last. He had started his career with Belfast Celtic and he received an Irish Cup runner-up medal with them in 1905-06, when they were defeated 0-2 by Shelbourne. In 1907 Mulholland aided Belfast Celtic to a City Cup success, his driven goal in what was essentially the decider against Distillery helping the Hoops to a 4-0 win. He moved across Belfast to sign for Distillery prior to the 1908/09 season. It was a to be a barren season for the Whites, one of the few highlights coming with a 2-0 victory over eventual League champions Linfield, when Mulholland claimed both goals. He left Distillery after only one year, when, accompanied by team-mate Willie Halligan, he moved to Leeds City in May 1909. At the time, Leeds were struggling both on and off the pitch, and cut-price moves for Irish League talent were common place. Both Mulholland and Halligan made their debuts in the opening day of the season in a 5-0 defeat of Lincoln City. It was to be a rare highlight, as he scored just twice all season, in a 5-3 reverse against Oldham Athletic, as he largely played second fiddle to Halligan. Leeds finished just above the re-election spots at the bottom of Division Two. The following campaign, 1910/11, was slightly more positive. Mulholland was Leeds’ second-top goal-scorer as he found the net on nine occasions, and mid-table respectability was attained. 1911/12 brought Mulholland his best run in the first team, as he played thirty-five games in all. However, Leeds struggled badly and finished in nineteenth spot, which forced the club to apply for re-election to the Football League. At the end of the 1911/12 season Mulholland was part of Herbert Chapman’s clear-out at Elland Road, and he returned to Ireland. 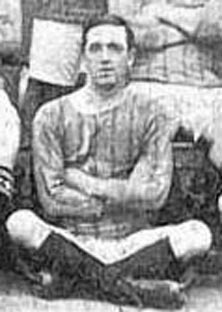 Initially Mulholland played with Belfast Blues (a short-lived team formed around Linfield Swifts and affiliated to the New Irish FA), before signing with Distillery for the 1912/13 campaign. He had brief spells back in England, playing Non-League football with Scunthorpe & Lindsey United, West Stanley and Halifax Town before returning to Belfast Celtic. His time back at Paradise also proved to be short, and he was back in England, playing for Hartlepools United, in 1920. He made his North Eastern League debut in a 1-3 defeat at Blyth Spartans on 16th October 1920. He scored twice in six F.A. Cup ties and his thirteen goals in twenty-three appearances in the North-Eastern League was enough to take the club to seventh place, and earn them a place in the newly formed Division Three (North) for the 1921/22 season. Mulholland scored Hartlepool’s first ever Football League goal, in a 2-0 opening day victory at Wrexham, but his League return lasted just five games and he played his last game on 26th November 1921 in a 0-0 home draw with Tranmere Rovers.